The range of pedagogical possibilities of the AUMI has exceeded our expectations. Here are some examples of how the AUMI has been used in classes at University of Kansas in American Studies, Dance, Music, and Theatre. AMS 101, Introduction to American Studies (Honors) (Sherrie Tucker). In Spring 2016, the focus of AMS 101 is on themes of "democracy" and "difference." What kinds of democratic practices best respond to the needs and input of everyone in the community? As part of this exploration, AMS 101 students work with Graduate Research Consultant, Caleb Lazaro Moreno, to explores the community improvisation jam and recording sessions at the Lawrence Public Library as possible sites of democratic practice. AMS 344,Veterans and Disabilities (Ray Pence). Pence incorporated an AUMI workshop into his class discussion of Dalton Trumbo's novel;Johnny Got His Gun, in which the protagonist's war injuries have cost him his arms, legs, sight, hearing and speech, but who figures out a way to communicate by tapping his pillow with the back of his head, in Morse code. The workshop assisted students in considering the possibilities of adaptive technologies such as the AUMI in terms of possibilities it opens up for people whose disabilities are such that their physical motion is compromised, with some comparisons to situations veterans with disabilities. AMS 650, Jazz and American Culture: Gender, Race, and Jazz (Sherrie Tucker). AUMI has proven extremely useful in the “free jazz” unit of this class to give students of a vast range of experience and inexperience in music-making the opportunity to explore what it is like to improvise together in exploratory ways (not playing “tunes” or even “chord changes”). AUMI enables improvisational collaboration among people who do not play traditional instruments, as well as those who are so disciplined by their musical training in ways not conducive to learning to improvise with freer parameters than they are accustomed to doing. It is an ideal tool for bringing “practice” into a cultural studies course about music outside the music department. AMS 998, Theories of Embodiment (Sherrie Tucker). Tucker embedded the AUMI in the design of this graduate seminar (Fall 2013), which incorporated theoretical approaches from feminist theory, queer theory, transgender theory, disability studies, and phenomenology. Seminar participants took part in the performance, "(Un)Rolling the Boulder: Improvising New Communities," and are creating an interactive group project about the performance on the Digital Humanities tool, Scalar. DANCE 100, Improvisation (Michelle Heffner-Hayes) and AMS 998: Improvisation, Bodies, Difference (Sherrie Tucker) Hayes and Tucker have developed and taught a collaborative interdisciplinary “meets-with” course among graduate students of theories of improvisation with undergraduates who are primarily dance majors. 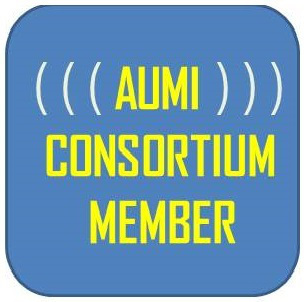 In Fall 2012, they added the AUMI to facilitate practice and dialogue about embodiment, disability studies, and sound and movement. In the center of the dance studio was a laptop with the AUMI interface and an amplifier. In pairs, small groups, and alone, students interacted and experimented with movement-triggered sound, range of motion, listening, and responding, and discussed their experiences in light of readings in disability studies, improvisation, and interconnections of music and dance. MTHC680 Electronic Music Composition II (Kip Haaheim) - This course focuses on electronic music composition and computer technology as it is used in multi-media. Although we always cover the basics of traditional collaborative media like film the specific content of the course varies each year depending on the nature of the course's final project. This year we are doing an interactive web-based project with architect/artist John Shreve in conjunction with various KU Research Units that examines a unique geographical location on campus in which widely various human activities intersect. A couple of years ago we created a show based on the ecological/agricultural research of Perfecto, Vandermeer, and Wright in their book "Nature's Matrix". I use the AUMI software in the class as an example of what sort of thing is possible with cutting edge technology if you think outside the usual expectations. We look at it as one example of how one might use video tracking as a controlling mechanism. THEATER (Nicole Hodges Persley): Beginning improvisation students in theater have used the AUMI to explore how their bodies can be tuned as instruments using limited mobility. By exploring the usage of their bodies in limited capacities, we hope to foster empathy and economy of movement in performance in able-bodied actors.